Gorgeous rosy cheeked crab apples, wildings, rose hips, haws from hawthorns (the fruits can vary so much but it’s easiest identified by the leaf shape…like tiny oak leaves), rowan berries, and apple roses with hips as big as tomatoes……other fruits I’ve foraged this Summer and used for jams and ice-creams include mirabelle plums and wild cherries and gooseberries from my friend Jan’s allotment…..so while at first it felt like the glass was a bit half empty, looking at all the different flavoured jams I’ve made instead, the glass is in fact full and over flowing. I’ve also made fruity syrups for sore Winter throats, variations on a rosehip one with haws and rowan berries for extra vitamin C, and a beautiful dark claret one infused with a handful of blackberries and the last of the elderberries. Along with the jams and jellies, there are boozey filled Kilner jars, inside an assortment of wild fruit, slowly drowning their sorrows in vodka, gin, cognac and brandy….this makes us sound like a right old pair but while neither of us are big drinkers (unless it’s tea) a little glass of something warming on a cold winter’s night hits the spot most pleasantly. 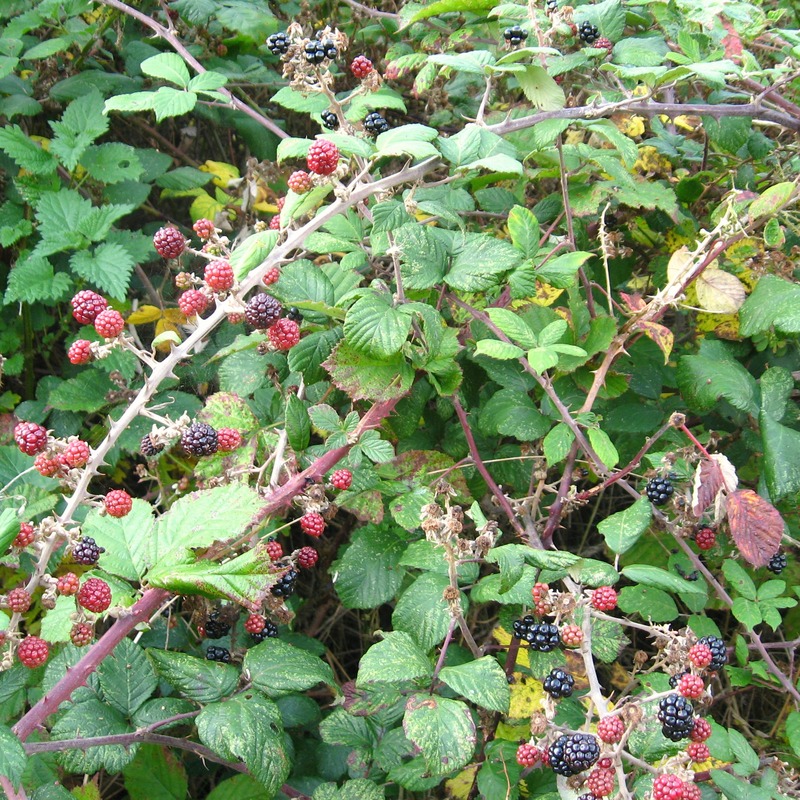 The other weekend while the weather was still all warm and sunshiney we went for a bit of an amble over the marshes and were properly treated by finding a row of blackberry bushes just laden down with fruit. While not as juicy or sweet as the blackberries we picked earlier in the season, these actually had a deeper flavour….many exploded as we picked them (too much rain of late so we ended up with foxglove fingers) or were as hard as bullets when we sampled a couple but that didn’t stop us from a happy hour or so of picking in the Autumn sunshine. 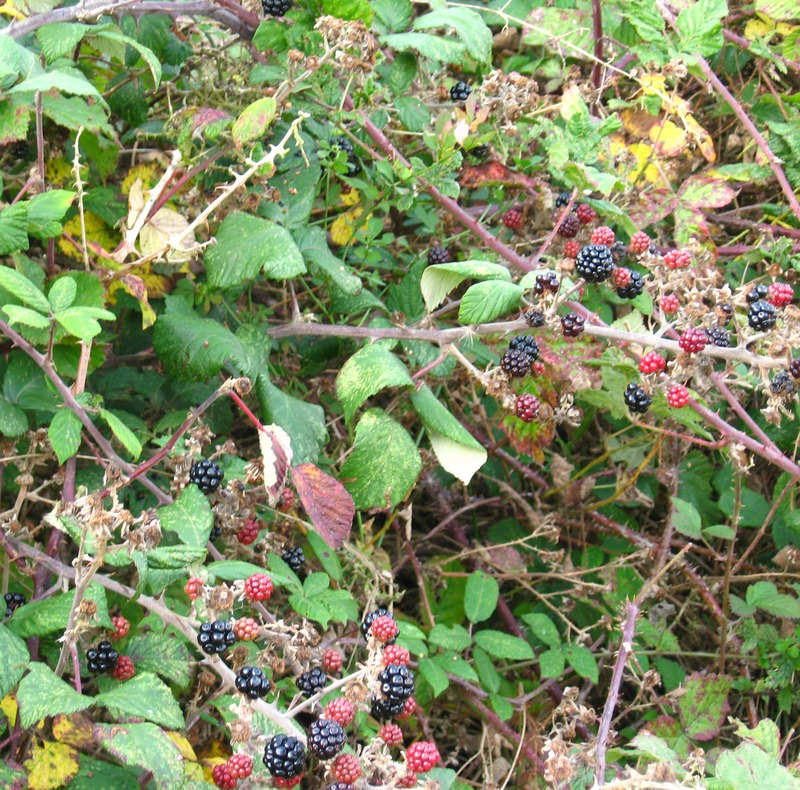 I’ve picked blackberries from this spot before, they’re the last of the berries to ripen up (other bushes were finished weeks ago) and they’re always a bit on the seedy side so are best used in jellies where the seeds are all strained out and just that dark intense juice remains. Measure your collected juice and for every 570 ml of juice you want about 450 g of sugar. I also add a good squeeze of lemon juice. On a gentle heat allow the sugar to dissolve into the juice, stir all the while so nothing sticks and then once it’s all liquid, turn up the heat and bring to a rolling boil for about 5 minutes, check for a set, and remove the foamy scum from the surface of the jelly. Pour into sterilised jars and seal……particularly good on tea cakes or fruit enriched loaves. Chop up the quinces (I had about 500 g) and tumble them into a big pan, cover with water (I used about a litre of water), bring to a boil and then turn the heat down and allow the quince to gently simmer for about 30 mins. Roughly chop your apples (I used about a kilo) and add to the simmering quinces, pour in about another litre of water and pop in a piece of cinnamon. Allow the apples to soften (about 20 minutes or so) before turning off the heat and letting the fruity pulp cool. Tip the fruity pulp into a big jelly bag (which you’ve soaked in water and wrung out just before using) and allow the juice to slowly drip drip drip into a waiting bowl below. Try not to squeeze the bag. Measure the collected liquid and for every litre of juice you want a kilo of sugar (I use white granulated)…on a very gentle heat allow the sugar to dissolve into the juice, once everything is a hot golden liquid, turn up the heat and keep stiriring while everything comes to a rolling boil….allow to bubble furiously for about 5 minutes, check for a set, remove the foamy scum and then pour into sterilised jars and seal. This is a nice alternative to marmalade as a breakfast preserve, and I used some in little jam tarts which disappeared incredibly quickly. *with the foamy scum, it’s best to remove it as it’s all filled with air and apparently stops your jam from keeping so well, but rather than chuck it, it can be microwaved for about 30 seconds or so and it tranforms back into jam…this can then be allowed to cool and served on scones or kept in the fridge for a day or so for toast or used to fill pastry case tarts…. (it won’t keep so it’s best eaten up quickly…like you need an excuse with home made jam). < Proper sheepy scented wool and the soporificness of my blue flecked wool…. What a coincidence, I have quince cheese bubbling away on the stove this morning! I love the way it turns from a pale yellow to the deepest rose colour. You write your posts so beautifully whereas my words just stay a jumbled mess in my head. 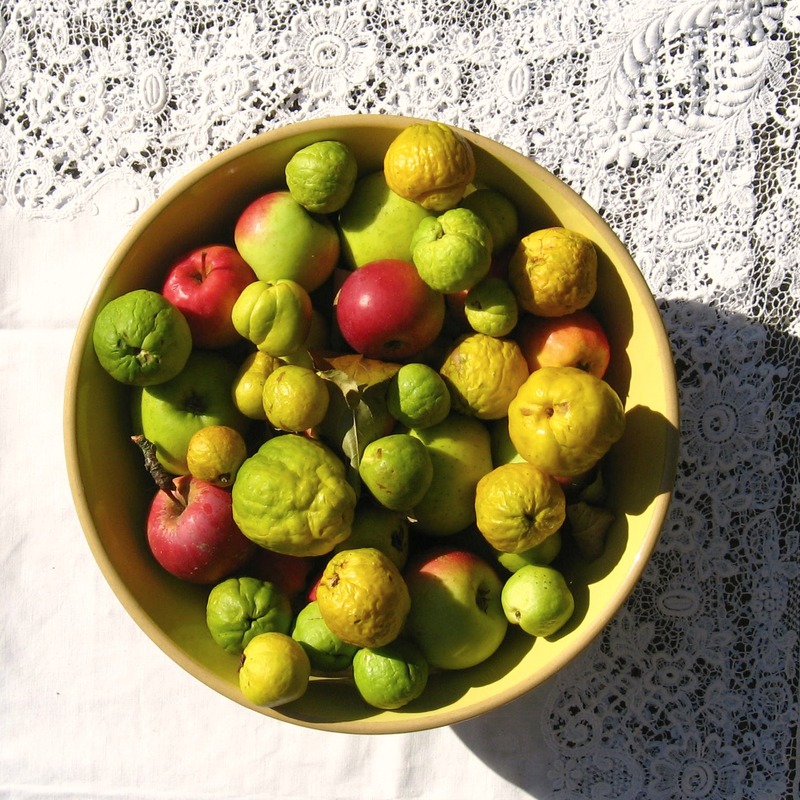 And my dishy delivery driver Alan told me today his little girl is called Quincey so it must be a Quince day…. What an adorable name. I wish I had a dishy delivery man!